Welcoming Partha das & Uttama devi dasi this Sunday! ~ The Toronto Hare Krishna Temple! Welcoming Partha das & Uttama devi dasi this Sunday! This weekend, the Greater Toronto Area Hare Krishna community will be welcoming Partha das and Uttama devi dasi. They will be facilitating a wonderful seminar on "Building Stronger Krishna Conscious Families" at ISKCON Brampton. Our Toronto temple will be welcoming them for our Sunday Feast discourse on Sunday, October 18, 2015. 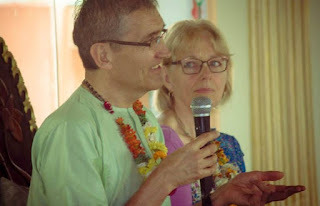 Both of these stalwart devotees are part of the Grihastha Vision Team (GVT), whose goal is to support, strengthen, educate and enliven the individuals, couples and families (grihasthas) who are or will be involved with the grihastha ashram (family life). The GVT helps devotee spiritualize their marriages and make it an act of devotional service - bhakti yoga. An important goal for the GVT is to help each person about to marry to receive premarital education. Mentoring is also useful for couples already married. Partha das and Uttama devi dasi have been married since 1971. They are both certified mentors with Vaisnava Version 108 and Prepare and Enrich. They have facilitated seminars for the GVT all over the world, in South Africa, England, India, Ireland, Brazil, Guyana, Trinidad, the US and Canada. They live in Saranagati Village, BC Canada, where they offer premarital education via Skype. We hope you can join us for this upcoming Sunday Feast wherein we will get a chance to hear from these two exemplary devotees!